Is there a better alternative to SiteTagger? Is SiteTagger really the best app in Browsers category? Will SiteTagger work good on macOS 10.13.4? 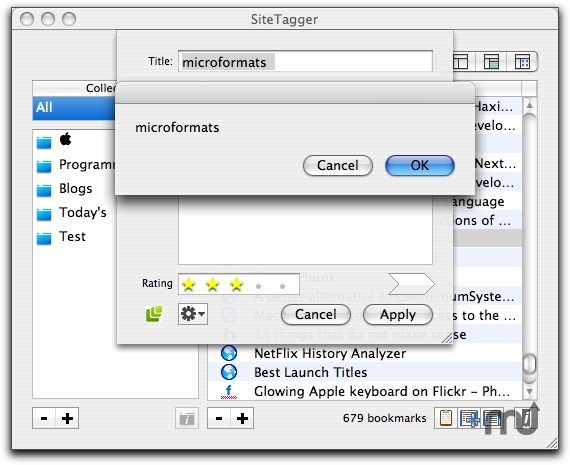 SiteTagger brings tag-based bookmark management to the desktop. Your bookmarks are fully searchable (by tag, title, content, and more), easily exported to a number of formats, and free from the constraints of Web browsers. SiteTagger brings all the features you've wanted in bookmark management with grace and style. Import your bookmarks from all your browsers into SiteTagger and enjoy them from one database. With SiteTagger, you can ditch your browser's bookmarking functions for something worth using. SiteTagger needs a rating. Be the first to rate this app and get the discussion started!